BC Historical Newspapers is one of Digital Initiative’s largest and most popular collections—and for good reason! A treasure trove of information is to be discovered within them. With over 24 different papers published from 1887-1911, there is a lot to choose from. The news then wasn’t so much a bulletin of events, but rather a Facebook for a century that didn’t have the internet. Many would send information to the newspaper, to post items about their doings. This is definitely social media in print – Look it’s even got ads in-between real content. The newspaper would also quiet generously post important information such as say… a flock of geese flying over town. But the most interesting (and lets face it- hilarious) part of the whole endeavor is diving into the world of backstabbing and general catcalling these newspapers participated in, printing almost daily attacks on one another. Often a few men owned the majority of the papers published in the region and would use multiple papers in their employ to attack their rivals. What’s more these guys did not pull their punches. 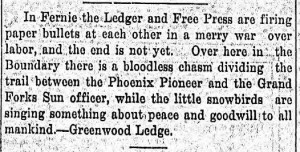 Here’s the District Ledger discussing the “paper bullets” (aka pot shots) the local papers sent at one another. 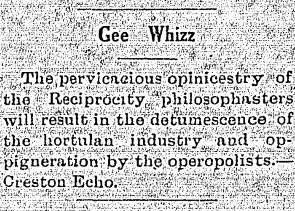 Below a string of insults is first directed at other papers in general (comparing them to posters – though today that might not be such a bad thing), then to a specific editor of a rival newspaper, and finally at the populace general. An attempt at humor in 1911- “water wagon” was a euphemism for not drinking alcohol. Another insult was published in the Creston Review and is completely indecipherable without either a good dictionary or the internet. 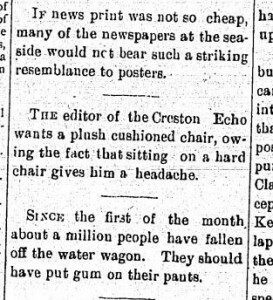 The best backstory though is the one of the Creston Review paper, which was owned by paper conglomerate J.J. Atherton, who owned a number of papers in the BC area. According to his daughter Atherton was a terrible gambler, both in that he loved to try is luck and that he hadn’t much luck to begin with. Due to this, he lost the Creston Review to a rival publisher after a game of cards! The paper, under new ownership, went on to jab him in print in the coming months in the best way possible- with nicknames and questioning his sanity. Of course Jay Jay jabbed right back using one of his other papers. Who knew there was so much gossip to be had in 100 year old papers? And there is plenty more where that came from. 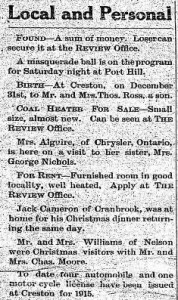 Check out the interesting world of the BC Historical Newspapers for yourself. And stay tuned, we will be adding more newspapers soon!